In 2016, I am continuing to let random.org choose a book from my TBR list, to be read sometime during the month. My randomly generated number for August is 319 (out of 430 in my TBR list). SURPRISE!, I will be reading The Chair, Vol. 1 by Peter Simeti, an adult horror graphic novel. A graphic novel is a lucky choice for August, as school is starting and I have some other books on desk that I must read soon. Richard Sullivan has spent the past ten years as an innocent man on death row. Witnessing savage killings at the hands of the prison’s sadistic and psychotic Warden, Sullivan decides that in order to survive he must match the brutality occurring in the prison. But as he fights to escape his fate, Sullivan is forced to question his sanity and confront his own horrific past. Panels’ 2016 Read Harder Challenge (26 specific categories of books): One this month-category 14, seven total–still gotta get going on this one. In 2016, I am continuing to let random.org choose a book from my TBR list, to be read sometime during the month. My randomly generated number for July is 342 (out of 412 in my TBR list). SURPRISE!, I will be reading The Good Braider by Terry Farish. I’m looking forward to reading this book that I have already added to both my school library collections. Book Riot’s 2016 Read Harder Challenge (24 specific categories of books): Two this month– category 7 and 12, 12 total–halfway there! Panels’ 2016 Read Harder Challenge (26 specific categories of books): One this month-category 26, six total–gotta get going on this one. Summer means I am reading many more adult books than usual, so I will identify them as such immediately. This is not to say that some adult books won’t be selected for high school or teen collections, but I am a middle school librarian so they are not ones I would include in my schools’ collections. Magarent Peterson Haddix is off to a great start of a new series with Under Their Skin. Spoiler alert: Middle schooler twins Nick and Eryn just can’t leave well enough alone when their mother plans to remarry and they find out their new stepdad has twins just their age whom they will never be allowed to meet. On a chance snow day, the two find themselves home alone and trudge to Ava and Jackson’s mom’s house and discover that the two are robots. In fact, they discover that EVERYONE older than they are robots, who were given the task of recreating mankind from frozen embryos many years after the rest of humanity was wiped out. But of course, that’s only the beginning of the story. Although the science in this science fiction novel is a bit iffy at times, kids won’t care as it is a page turner. And it will also make them think. Through the Woods, written and illustrated by Emily Carroll, is a graphic novel/picture book hybrid that is delightfully dark and creepy and definitely for middle schoolers and up. The five short stories are ghostly and/or ghastly and the vivid (mostly) black and red illustrations are a perfect match. There’s a lot of unsettling teeth/mouth imagery, which always seems to freak me out a bit. 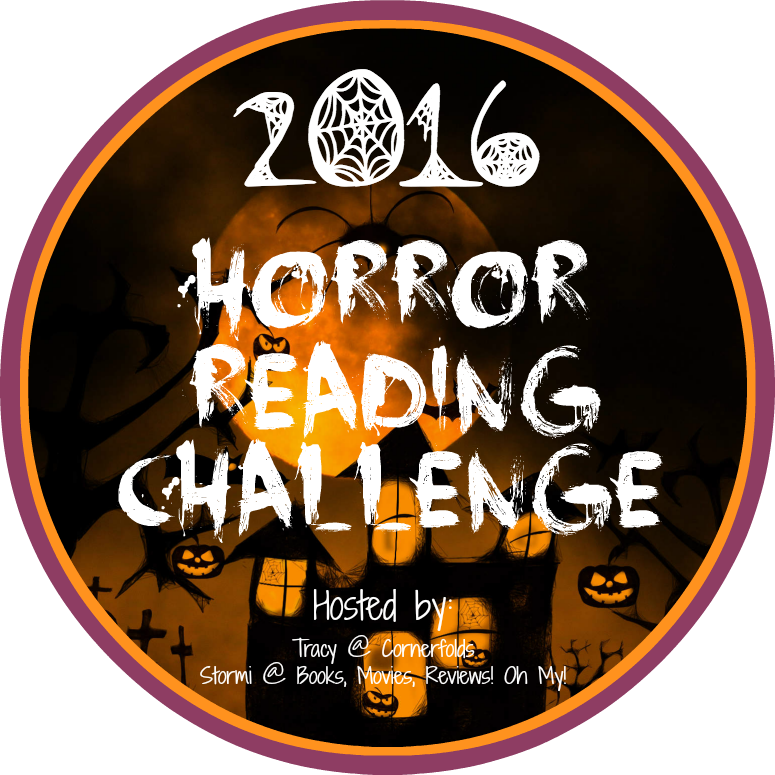 This book counts for my Horror Challenge 2016. House Arrest by K.A. Holt is such a heartprint novel in verse! As the book opens, we learn that we are reading the court ordered journal that Timothy was “sentenced” to write as part of his probation for stealing a man’s wallet. Readers quickly learn that there is much more to the story–Timothy used the stolen credit card to buy over $1100 worth of prescription medicine for his baby brother, who must rely on a trache to breath. Timothy and his mom are struggling to not only care for Levi but to afford house payments and food since Timothy’s dad walked out on them. The voice is SO STRONG in this book! Timothy is at first the tough guy, insulting his probation officer and clamming up when visiting his therapist, but once he opens up, readers see the fragile yet strong, wonderful person inside. I can’t wait to share it with my students in the fall. Don’t miss this one. The Boy on the Wooden Box by Leon Leyson should be required reading for students learning about the Holocaust. Leyson was a young teen when the Germans barged into Krakow, changing his life forever. Leyson gives us an inside look from someone who worked for Oskar Schindler and was on his famous list. This book has been out for a few years so I am a little late in the game, but the rave reviews of others are all true. Please direct your students to this fine, important memoir. I picked up Beautiful Darkness by Fabien Vehlmann from my local public library because it is a watercolor graphic novel–and that fulfills a category in one of my reading challenges. Its description as an anti-fairy tale was intriguing as well. Boy, did I have no idea what was in store for me! The book opens as Aurora and Prince Hector are sharing tea and all of a sudden strange goop starts plopping down from the ceiling. They and other “cave” inhabitants are able to crawl out, revealing that they were all inside the body of a dead little girl. These miniature people are now in the forest and must find a way to survive amidst the animals living there. Except their survival turns into something reminiscent of Lord of the Flies, as they do not live peacefully and often turn against one another. One horrific, unsettling thing happens after the other and it is all done in a somewhat cute drawing style, making it all the more creepy. I was a bit stunned after reading it and then gave it to my son who is entering high school and he had the same reaction. My 20-year-old daughter has it now, so it will be interesting to hear her thoughts as she relishes the macabre. This book counts for my Horror Reading Challenge 2016. This book also counts for my Panels Challenge 2016 (category 26–watercolor comic). I don’t think there are enough words to describe how much I love Andrew Smith’s work. I finished listening to 100 Sideways Miles and was again blown away by how strong of a voice he gives to the teenage boys he writes, his beautiful use of language and repetition, and his thought-provoking stories. Finn Easton is a 17-year-old whose life so far has been defined by three things: 1. his mom was killed and he was severely injured by a freak accident when a dead horse fell off of a bridge and onto them 2. he has epilepsy and 3. his father wrote a cult science fiction novel and named his main character after Finn and referenced Finn’s unique scar from the aforementioned accident. Finn is trying to “break out” of his father’s book and be his own person with the help of best friend Cade Hernandez and new girlfriend Julia. This book about first loves and road trips and growing up and away is a treasure. And I must once again say what an excellent narrator Kriby Heyborne is. He helped bring Finn to life in a way that made me so glad I listened to the book rather than read the print version. Adult book: Fables, Vol 6 is the continuation of Bill Willingham’s great series of fairy-tale characters come to life and living a secret existence in tandem with our world. In this installment, Jack (of beanstalk fame) tries his hand as a big-time Hollywood producer, we definitively learn who The Adversary is, and Little Boy Blue becomes quite the badass hero. Great as always.